Since 1985, Custom Marine Canvas has been making boaters visions a reality through quality design and fabrication. Winner of several International Achievement Awards from the Industrial Fabrics Association International (IFAI) and the Marine Fabicators Association (MFA), we are ready to improve the enjoyment of your on-the-water experience. The Marine Fabricators Association (MFA) recently announced the winners of the 2016 Marine Fabrication Excellence Awards Program held during the MFA National Convention, January, 2016, in Clearwater, FL. Custom Marine Canvas received an Outstanding Achievement in the Complete Interior Upholstery category, an Outstanding Achievement in the Exterior Upholstery category and an Outstanding Achievement in the Full Exterior Canvas Sailboat 27′ and Up category. Sponsored by MFA, a division of the Industrial Fabrics Association International (IFAI), the MFA Fabrication Excellence Awards Program recognizes the latest advances in technical fabric design and manufacturing in the marine textiles industry. 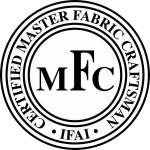 A team of MFA members, who are Master Fabric Craftsman (MFC) Certified, judged the program entries with the following criteria: 25 percent design, 25 percent craftsmanship, 25 percent originality, and 25 percent difficulty. Saturdays in January, February, and August by appointment. © 2016 Custom Marine Canvas. All rights reserved.